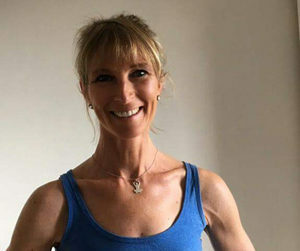 The Ananta Yoga Studio was established in April 2009 by Liz Richards having successfully completed two extensive Yoga teacher training courses. Liz had begun teaching Vinyasa Yoga six months prior to this in a dance studio in Wicklow Town. 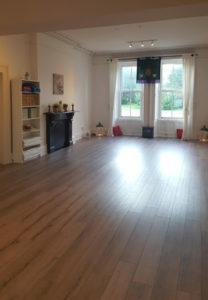 As demand grew for a larger variety of class levels and times, she took the plunge and opened The Ananta Yoga Studios in the beautifully restored Old Tap building between Wicklow and Arklow on the old N11. 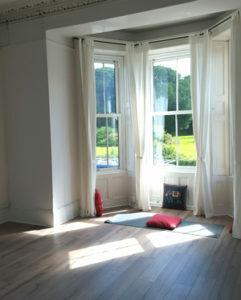 In August 2016, Liz moved the studios to a new and equally beautiful space in a lovely Georgian building at 5, Wentworth Place, Wicklow Town over looking the old Abbey grounds. The original warm, bright, and spacious studios are purpose built and the interiors retain all the lovely charm and original features of this beautiful old building. Large sash windows allow natural light to flood in to both studios and afford stunning views of the old Abbey grounds which are also home to mature trees and green park areas. Old fireplaces and detailed coving give the studios a soft, cosy authentic ambience and are conducive to restful and peaceful class times for our students. Our extensive class schedule has continued to grow steadily with the addition of ten fantastic new instructors – all highly qualified and experienced in their chosen disciplines. The quality and standard of our classes and level of instruction given to all our students in every discipline is our number one priority. Our teachers are continually upgrading their teaching skills through further training and are always students themselves. The studios are attracting students not just from the surrounding areas but from as far north as Bray, Dun Laoghaire and South County Dublin and as far south as Wexford for regular weekly classes due to it’s accessibility and growing reputation for excellence in the areas it specialises in. It is also a popular venue for visitors to the area – many who stay in Wicklow for the summer in the coastal caravan parks and wish to keep up their practice and attend classes whilst on holiday. Students regularly travel from Europe to attend Workshops & Trainings in the studios and the venue has become popular with visiting Senior International teachers who enjoy the great energy in the space, the enthusiasm of all our students and the efficient management of the studios and events being held there. 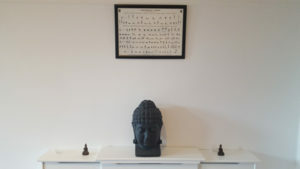 The aim at The Ananta Yoga Studios is to provide a warm and friendly environment where students can have some well deserved time to unwind, escape and enjoy their weekly classes under the guidance of experienced and caring instructors at competitive class rates. We are dedicated to the teaching and practice of yoga as an education rather than a form of entertainment and are committed to transmitting the ancient teachings in an authentic and direct manner with guidance from senior teachers with direct lineage from Krishnamacharya. We have always endeavoured to create and maintain a yoga space which is as technology free and non-commercial as possible to allow students a chance to re- connect to themselves with as few external distractions as possible. We aim to provide a holistic approach to physical, mental and spiritual health and well being through the classes we offer and are delighted to have many students who have been through a range of our classes as their lives change and evolve. Take some time for yourself and come along and try out a class! We will be waiting for you.